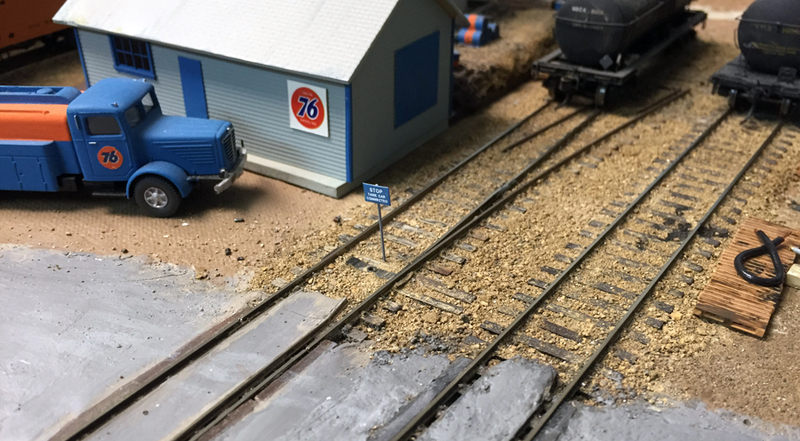 I have previously posted several comments about blue flags in model railroading. 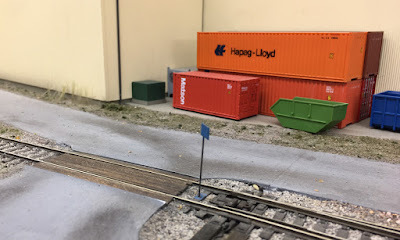 I began with some discussion of the prototype use of blue flags for various kinds of safety notification (that post can be found at this link: https://modelingthesp.blogspot.com/2017/04/blue-flags.html ). I followed up that post with a description of how I produced a set of blue flags to use on my layout, along with illustration of the insertion points I created (between pairs of ties) so that the flags could be placed for operations (see that post at: https://modelingthesp.blogspot.com/2017/04/blue-flags-part-2-modeling.html ). But I quickly discovered two things about using these flags in an operating session. First, they are scale size and a medium-hue color, and are accordingly all but invisible under ordinary layout operating conditions. Crews have in fact run cars or locomotives right over the flags. The brass wire stanchions of the flags can be straightened and repainted, but the point is that the flags aren’t serving their warning purpose very well. I realize they are pretty small. The photo below, in my layout town of Ballard, illustrates the visibility problem (check the left-hand track). The second point I recognized is that there is not a good way for crews to know either that flags are in place, or a time when the flags might be removed. One possibility here is to use the method that Seth uses on his layout, simply to tell crews that if they encountered a blue flag in the way of a movement that they needed to make, they should consult the Superintendent (Seth) as to when the blue flag might be removed. 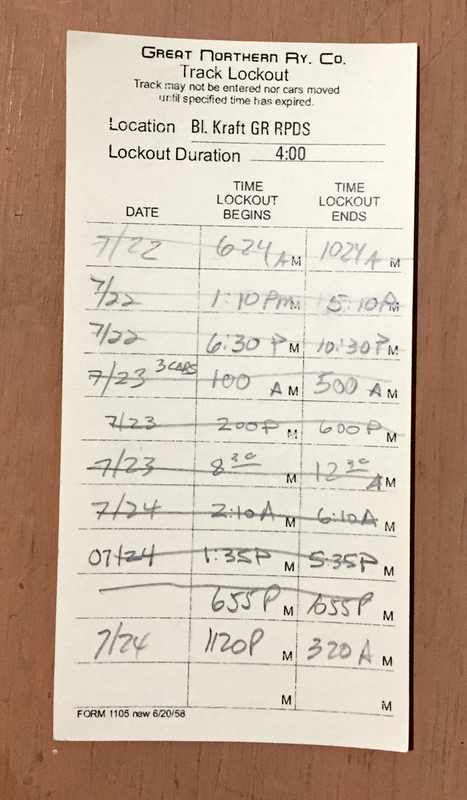 I could do the same, but was searching for a more “paperwork” way to accomplish something similar. I thought that this might be a way to inform crews about blue flags. 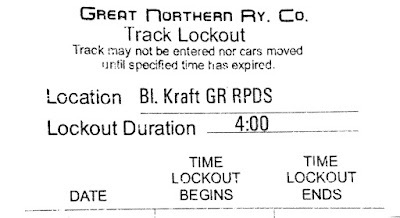 Bob’s form shows a fixed length of lockout, four hours in the case of the particular form shown above, but I don’t see why there would be a fixed time for most shipper situations. 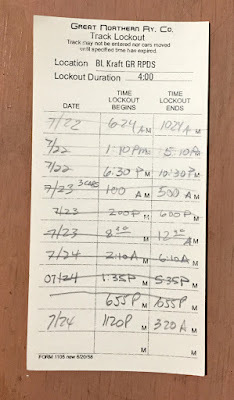 Instead, I would think the agent, appropriately notified by the shipper, would give a starting and (estimated) ending time for the lockout, thus notifying the crew when the blue flag should be lifted. 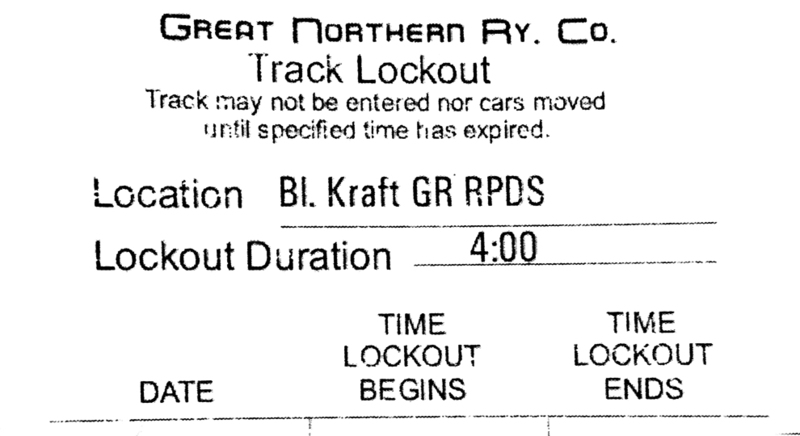 Of course, on arrival, they might find that the shipper or consignee wasn’t quite finished with the car, and would need to wait. I have heard former employee stories like that, of having to wait for the loading dock foreman to give them the “okay” to move a car. I will have to mull over ways to do that in an operating session. But a form like the one Bob Hanmer created will be a welcome step in the right direction. I will have to put some thought into the precise format I want. I've thought about this, too, and wanting to avoid oversized flags. One option I have pondered is dropping a contact switch under the track that inserting the flag post would depress and light a small blue LED either between the rails or on the fascia. Good thought! A blue LED would definitely be attention getting, and as you likely know,the prototype used a blue light at night to make sure blue flags would be visible, so the idea is prototypical as well.